The design of the Ubon SP-50 Wooden Wireless Bluetooth Speaker seems to be from the early 1,900’s. It is an old-school design mixed with modern technology. The BT speaker has a mixed built of wood and plastic. The majority of the SP-50 is made out of wood while some of its parts like the controls or the smartphone dock is made out of plastic. Even though it is made of two materials, but both have more or less same colour scheme which gives it a one-tone colour look. The front of the speaker houses the speaker grills made out of plastic, inside which two small sized speakers are placed along with a small sub-woofer. 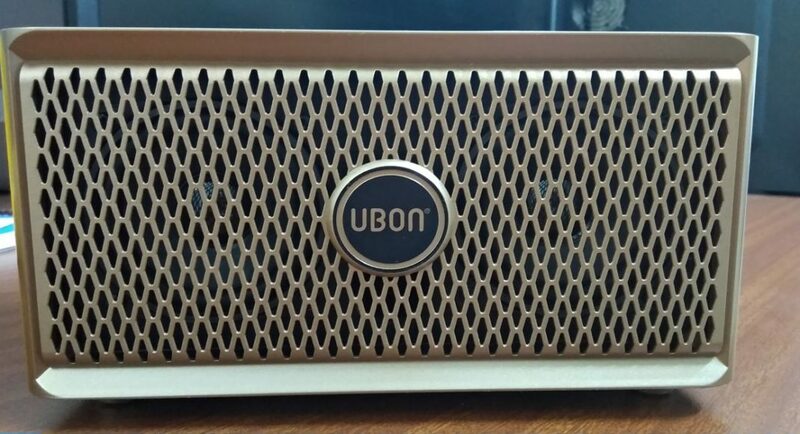 The UBON logo prominently sits on the front of the speaker grills. The top of the speaker has the smartphone dock where you can place your smartphone or tablet in a dock cut out. 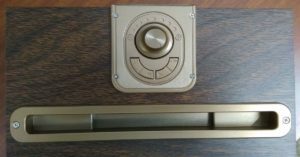 The top also houses the media controls and the volume dial. To elaborate, there are 4 buttons placed on top of the UBON SP-50 accompanied with the volume dial. The four buttons are — Previous, Next, Play/Pause and the Mode selection button. All the buttons are made out of plastic and have a sturdy feel, but the volume button is a bit hard to rotate i.e., its movement is not fluid. The left and the right side of the speaker is plain and doesn’t have anything. But the back of the device houses the main controls and connectors. 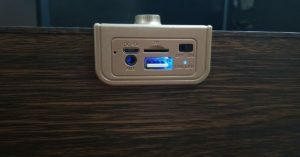 There is a power on/off switch at the back of the UBON SP-50 speaker along with a USB connector, which can be used to play songs from a pen drive. There is also a microSD card slot that can be used to directly play the songs from a compatible card. Over that, there is also an AUX jack available here, which can be used to connect the speaker to the smartphone or other devices. There is also a micro USB slot which is the charging port of the Ubon SP-50 Wooden Wireless Bluetooth Speaker. Weirdly, the LED notification light is located at the back of the device. It was hard to understand if the device was turned off or on when looking from the front. The light usually glows blue when in normal mode, red in low battery mode and blue + red while charging the speaker. The device comes in only one colour variant – Brown Wood. Since it is light wood, we at times felt that if the device drops it might break. Also the surface will get scratched very easily. The Ubon SP-50 Wooden Wireless Bluetooth Speaker has a boxy build and although it seems like one would want to carry it, it will be a hard task carrying this speaker inside a bag, as portability is a bit of an issue. These are best kept inside the house. The Ubon SP-50 Wooden Wireless Bluetooth Speaker packs two 10W speakers and they have a frequency range of 60Hz to 15KHz (15,000Hz). There is also a small hole cut-out between the speakers, which houses the sub-woofer. It comes with Bluetooth 4.0 and has 10 metres BT working range, which is an acceptable distance. The speaker comes with a 2,000mAh battery and the company has promised a battery life of 6 hours of playback time on a single charge. And when we tested the speaker it was able to give just about that much, which is a good battery backup for a Bluetooth speaker. As mentioned earlier, it can play songs via Bluetooth, microSD card, Pen drive, AUX cable and it also comes with an in-built FM Radio. The company had also promised that it can reconnect with the last device connected to it which is true. Once our smartphone’s Bluetooth was turned on, the Ubon SP-50 Wooden Wireless Bluetooth Speaker automatically detected and connected with the smartphone. So the headache of re-pairing a device goes away, as the device remembers. Now coming to the main part of the Ubon SP-50 Wooden Wireless Bluetooth Speaker — the sound. 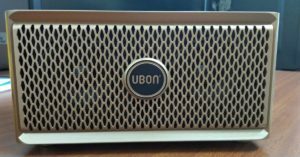 In which the Ubon SP-50 Wooden Wireless Bluetooth Speaker performs quite well. In brief, the Ubon SP-50 Wooden Wireless Bluetooth Speaker is loud. It gives a good mixture of lows and highs. The treble is clear and it also has a good level of bass. Although the speaker doesn’t have a wide sub-woofer, it delivers quite well in the bass department. 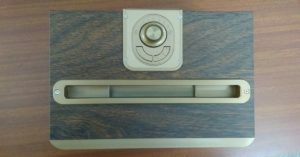 The company promised HD and stereo sound quality from the Ubon SP-50 Wooden Wireless Bluetooth Speaker and it was true to quite an extent. What we expected from this Speaker was delivered to us. Even though it did not exceed our expectations, it passed our tests with good marks. The Ubon SP-50 Wooden Wireless Bluetooth Speaker delivers what the company said it will deliver, no more and no less. It offers good sound quality with good levels of treble and bass. The sound offered by it is clear and loud and even the low notes are precise. Its build quality gives a retro and vintage look but at times we did feel it is not too sturdy. And lastly the price, with a price tag of Rs 2,990, it has stiff competition in the market. As others are giving water proof capability for just Rs 200-300 more.